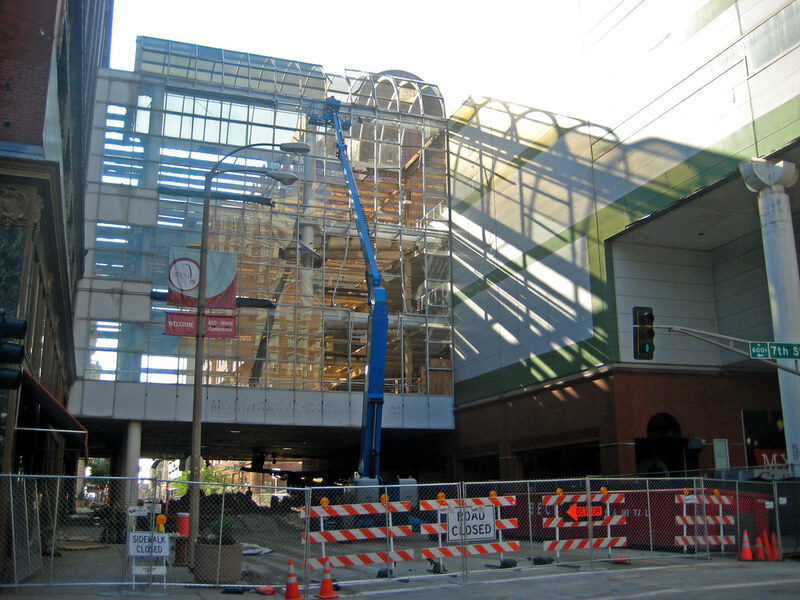 Less than a week after the "Bridge Bash", The east wall of the St. Louis Centre sky bridge over Washington Avenue has been reduced to almost a skeleton. About three weeks from now, the entire structure should be nothing but a bad memory. 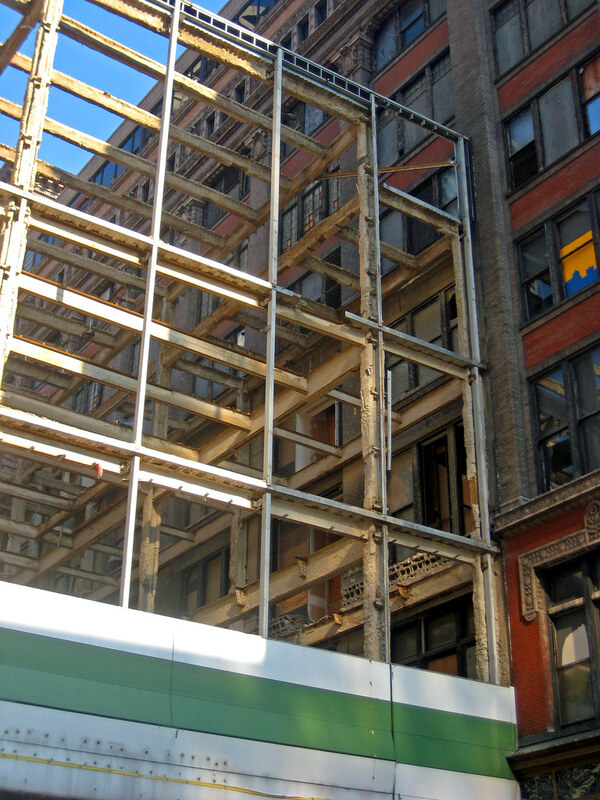 After being hidden for over twenty five years, the facade of the former Stix Baer & Fuller department store reveals itself. 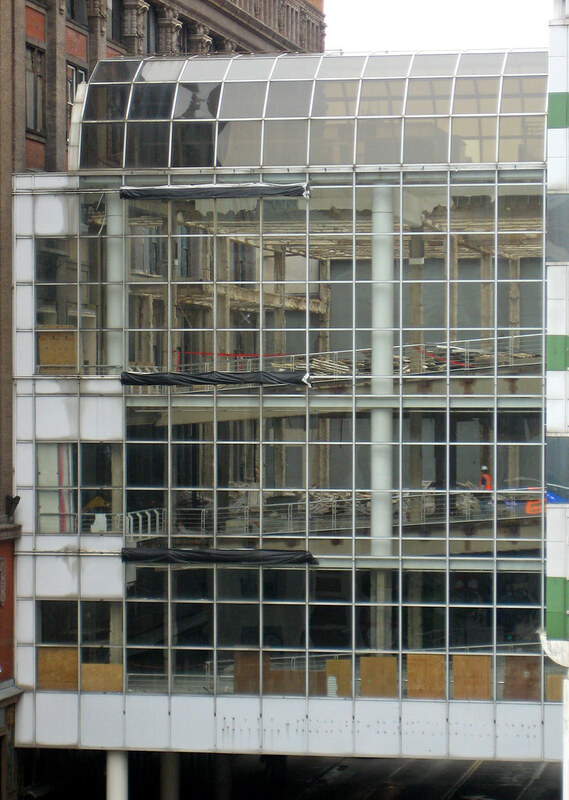 While the facade is largely intact, including original windows still in place behind the mask of the bridge, this view shows how the projecting ornamental terra cotta band course at the third floor window sill level was sawn off to accommodate construction of the mall structure. This feature will be restored as part of the restoration for the facade of the building, which will be transformed into an Embassy Suites Hotel and apartments. 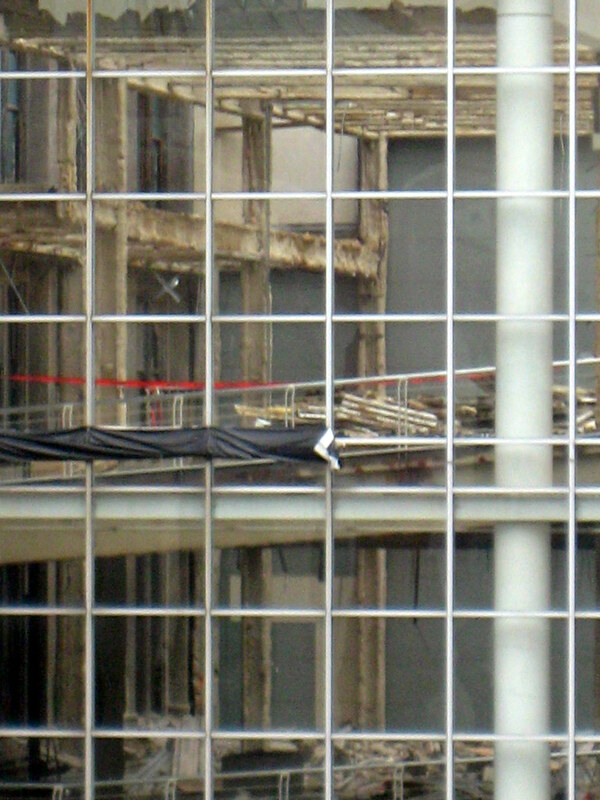 As the bridge is deconstructed, it has become transparent, allowing the sun to filter through. Below however, the sun almost never penetrates this space. Now that the St. Louis Centre bridge is well on its way to oblivion, City to River would like to turn your attention and your actions eastward to the soon to be former Interstate 70 as it hovers ominously above Washington Avenue and extends northward for nearly three quarters of a mile. As we are currently meeting with area property owners, Downtown & riverfront neighborhood stakeholders, and developers to gain endorsements as well as the Arch design competition finalist teams to urge them to include highway removal in their concepts, we also are reaching out to the general public for support. What can I do to help you may ask? Today, the City to River Blog has outlined a few simple things YOU can do to help make the vision for a New Memorial Drive a reality. Please click the link above and take a few moments to show your support for reopening the front door of St. Louis. 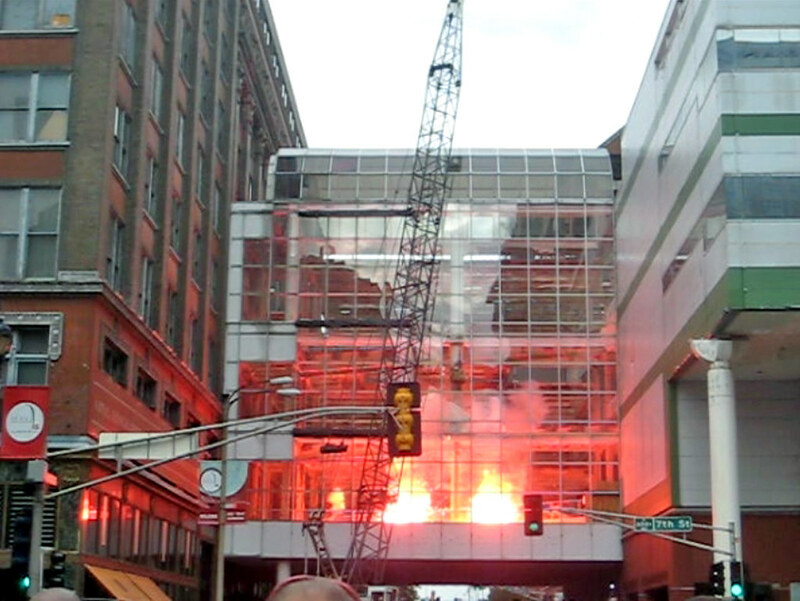 Friday marked a monumental milestone in undoing the planning mistakes of the past with the ceremonial first blows of the wrecking ball to St. Louis Centre bridge over Washington Avenue. Once the St. Louis Centre bridges are history though St. Louis should continue this momentum of re-connectivity eastward with removal of the final barrier between Downtown and Laclede's Landing, Arch grounds and Chouteau's Landing as is being promoted by the volunteer citizen group City to River. 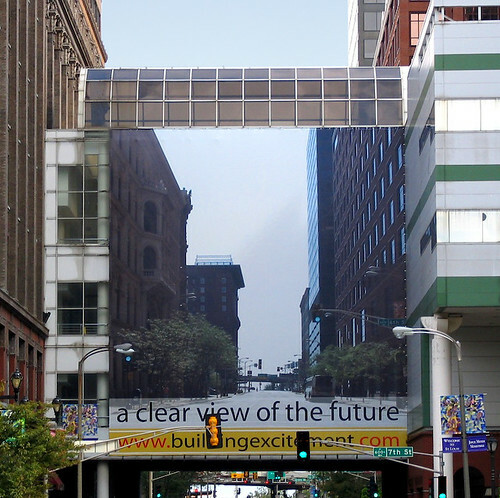 The removal of the St. Louis Centre sky bridges will open up a quadrant of Downtown that has seen little revitalization over the last decade as most projects have tended to be concentrated in the Loft District, Post Office Square, or scattered south of Locust Street. Much potential lies in this once isolated corner of Downtown, especially with the proximity to the convention center and Edward Jones dome. 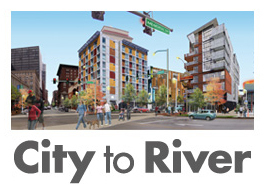 To truly reopen the front door of a revitalized Downtown St. Louis to the riverfront though replacement of the soon to be former interstate (I-70 will be re-routed across the new Mississippi River bridge) with a pedestrian and retail friendly boulevard is essential. 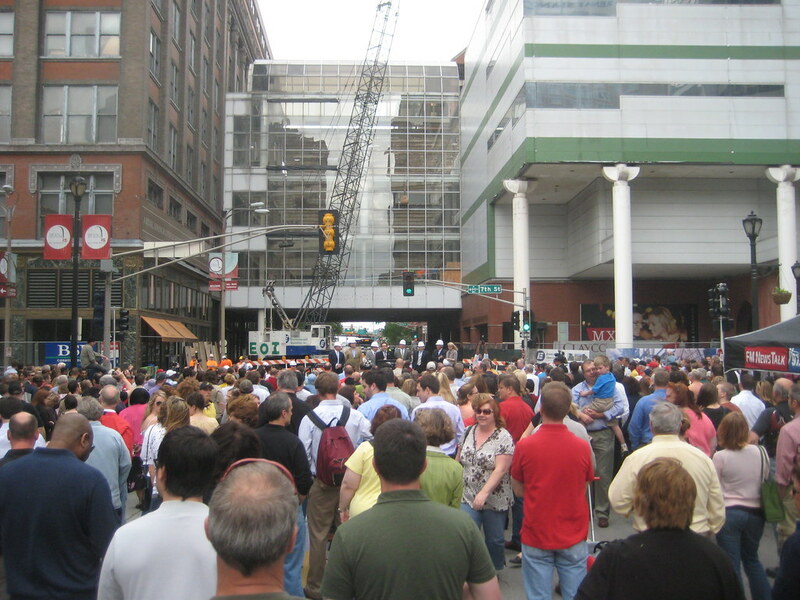 As our region competes for major conventions, including the upcoming 2012 Democratic National Convention, creating an environment that is an attractive place to visit and walk around is critical. For decades we have invested in major infrastructure including the convention center, the airport, the dome, etc to attract major conventions, but we have failed to look at at the environment where visitors will spend their time walking around Downtown on their free time. With the Arch and riverfront as major attractions, it only seems logical that the areas surrounding them should be attractive and desirable places to be. 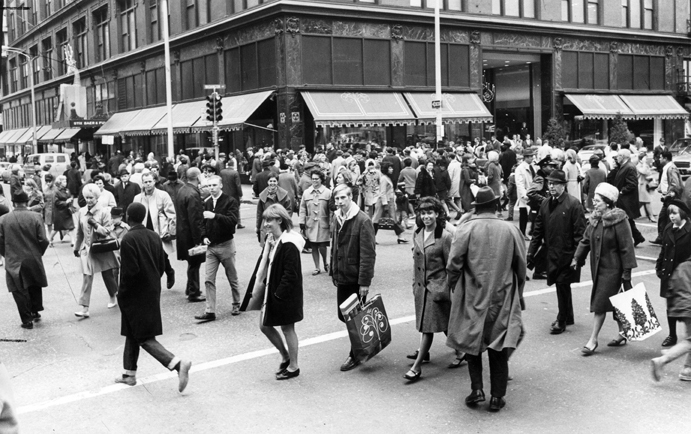 It is time we reopen the front door of Downtown to these amenities for which St. Louis is known world wide by saying goodbye to the highway. Hundreds, if not a few thousand people turned out for Fridays "Bridge Bash"
In about four weeks the view that Pyramid Companies hung on the side of the bridge in September, 2006 will finally become a reality. Muny Terrazzo to be Restored! 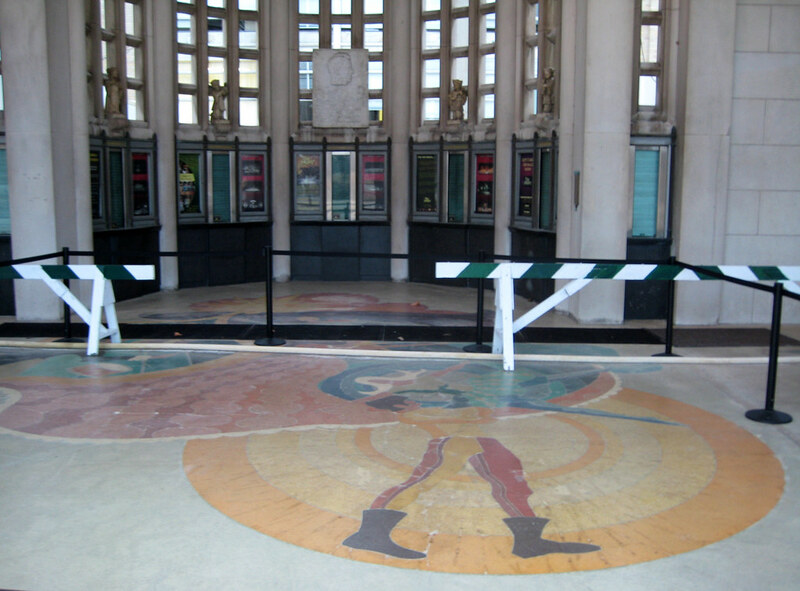 The Post's Culture Club blog reports that the beautiful terrazzo floor in front of the Muny's ticket windows that was destroyed earlier this year will be re-installed in the fall after the close of this year's season of shows. The work of art by Nancy Day was damaged in January of this year by a ruptured water main that heaved the sidewalks in under the Muny's stone portico. Thanks to the generosity of the Marilyn Schnuck Charitable Trust, the lost artwork originally installed in 1971 will be re-created in its original location. 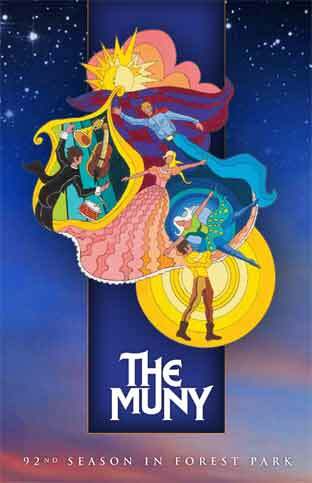 In the mean time, the design of the terrazzo mural will be featured on the front cover of the Muny programs. 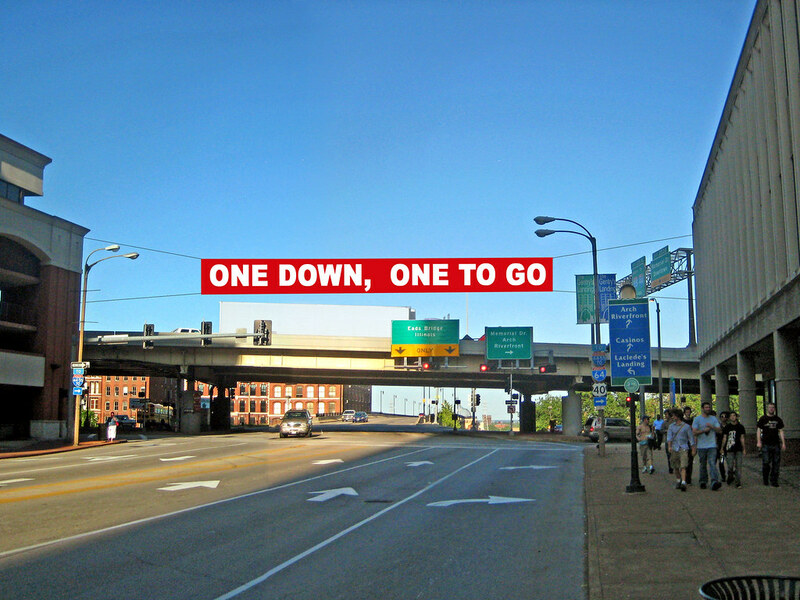 Its a very rare occasion when a demolition in St. Louis calls for celebration, but this Friday, May 21st at 5:00 pm will mark the beginning of the end of an eyesore as a wrecking ball starts its work on one of two street bridges at the former St. Louis Centre mall that has for 25 years acted as a physical and psychological barrier along the Washington Avenue corridor and brought darkness to the block between 6th and 7th Streets. 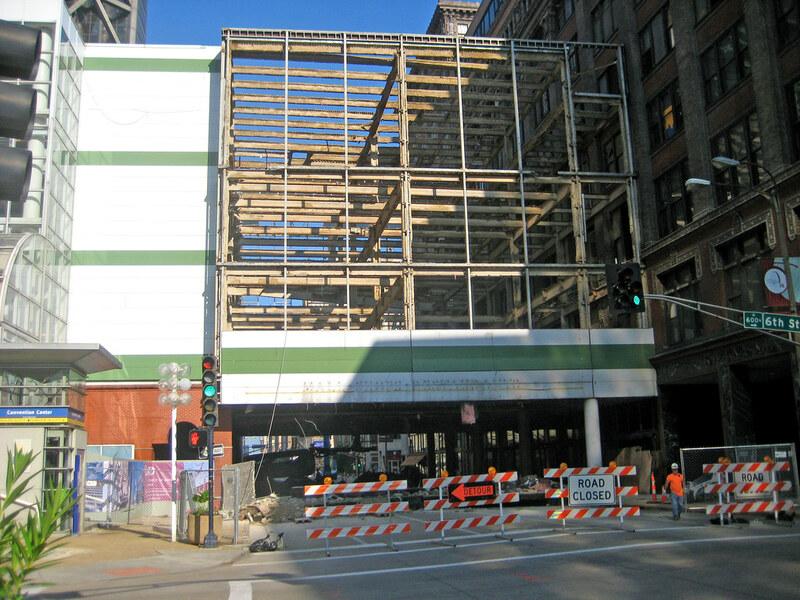 Washington Avenue will be closed to traffic on Thursday between 6th & 7th Streets to begin staging for the work and on Friday US Bank will mark this eventful occasion by throwing the Bridge Bash from 4:00 to 7:00 pm on Washington Avenue between 8th & 9th Streets. There will be food, beverages and yes, dancing in the street. At 5:00 sharp the wrecking ball will start swinging. 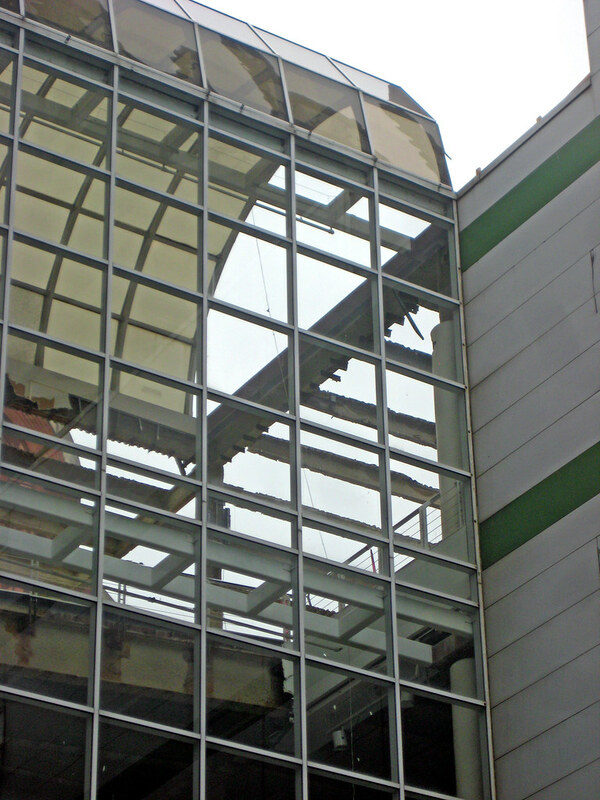 Demolition of the structure actually began a few weeks ago, and a close look through the glass curtain wall on the west face of the bridge reveals that most of the roof, all interior partitions and sections of floor at the 4th floor have been removed. Demolition of the remaining portions of the bridge is expected to take about four weeks. As interior partitions are removed, the windows of the former Stix Bear & Fuller department store building are beginning to be revealed. 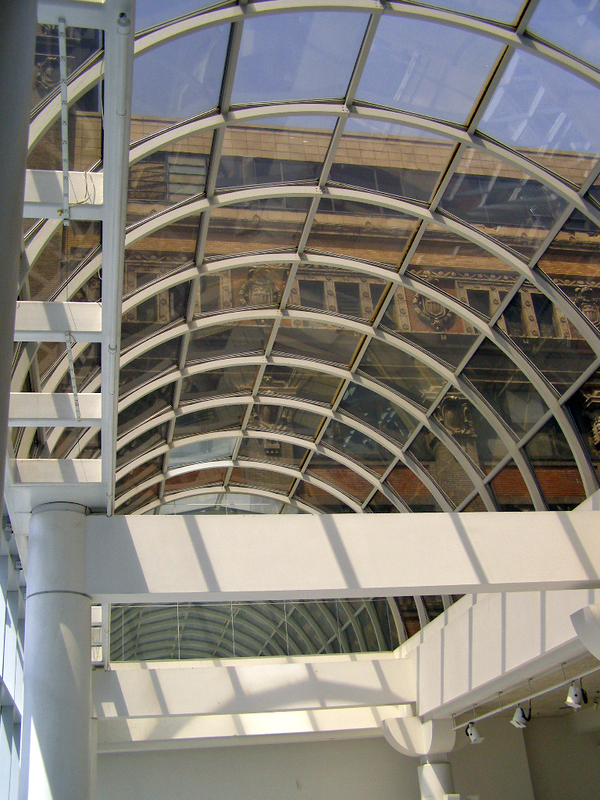 While connected to the former department store, fortunately, the bridge was built as an independent structure from it and much of the facade simply remains hidden behind the mall structure. On the mall end of the bridge the end of the glass barrel vault roof has been removed as well as the roof of the portion of the mall that extends our over the Washington Avenue sidewalk. 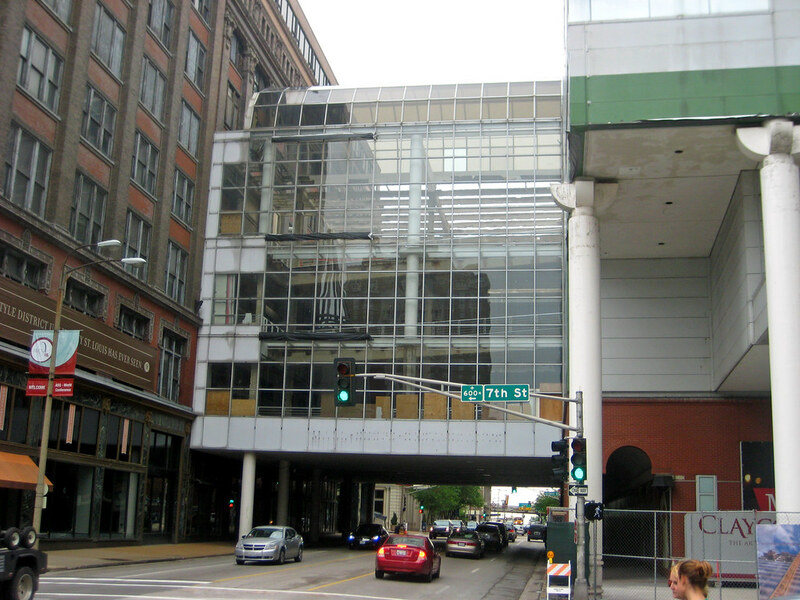 Along with bridge and the the white and green metal panel skin of the mall, this skinny portion of the building over the sidewalk will be removed as well. Darkness at noon. Even when the lights were still on, the spaces under the mall bridges were dark oppressive spaces. 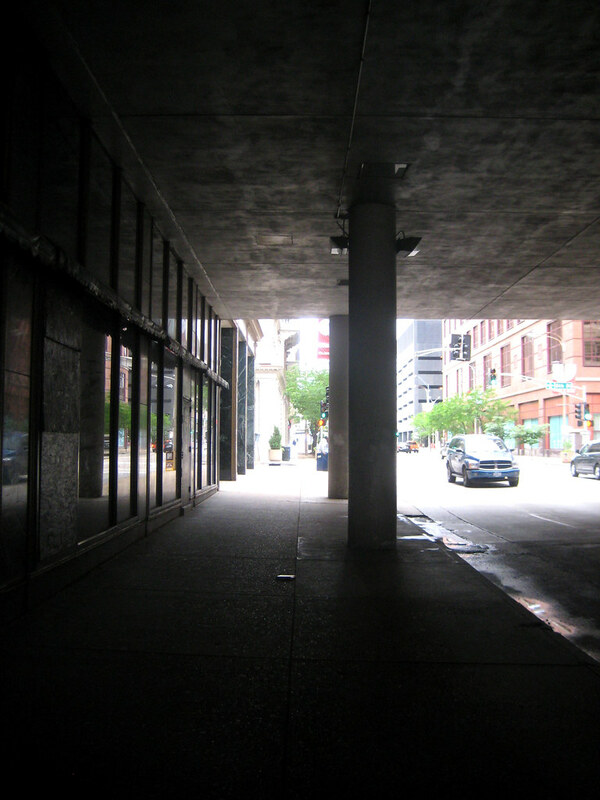 Like the elevated highway structure that separates Downtown St. Louis from Laclede's Landing, no amount of lighting or artwork can make up for the dismal experience of these confining spaces. 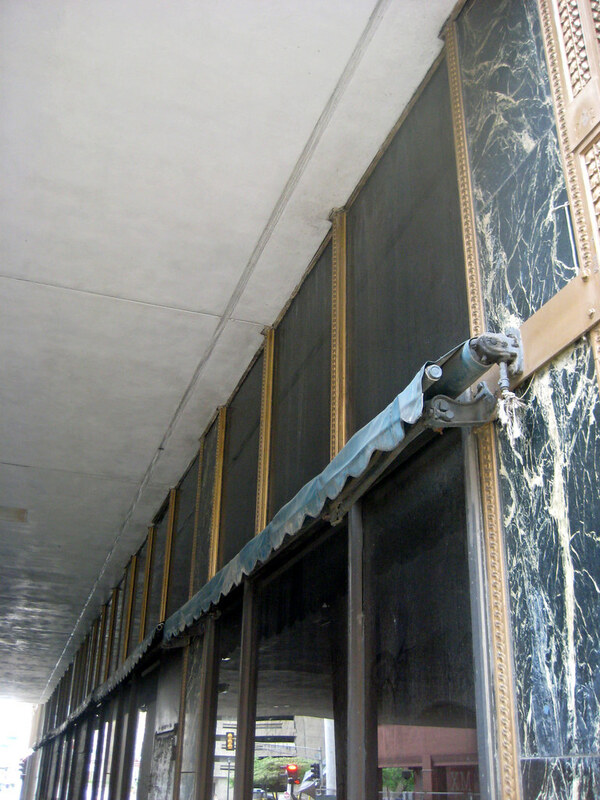 Above the storefront windows of the Stix building are vintage retractable awnings. 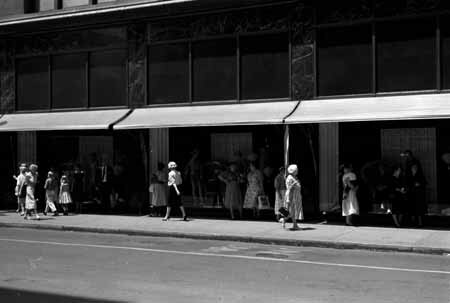 These are the same awnings that are shown in the 1959 photo below from the Western Historical Manuscript Collection. Strangely, the windows under the bridge are the only ones that retain these now rare mechanisms. They were removed from the rest of the building longer ago than I can remember. 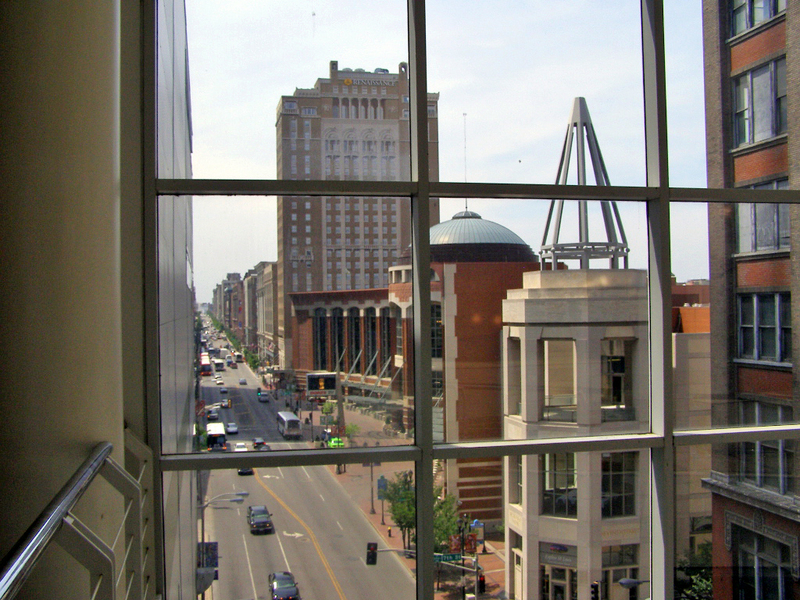 The view west on Washington Avenue from the soon to be demolished bridge. 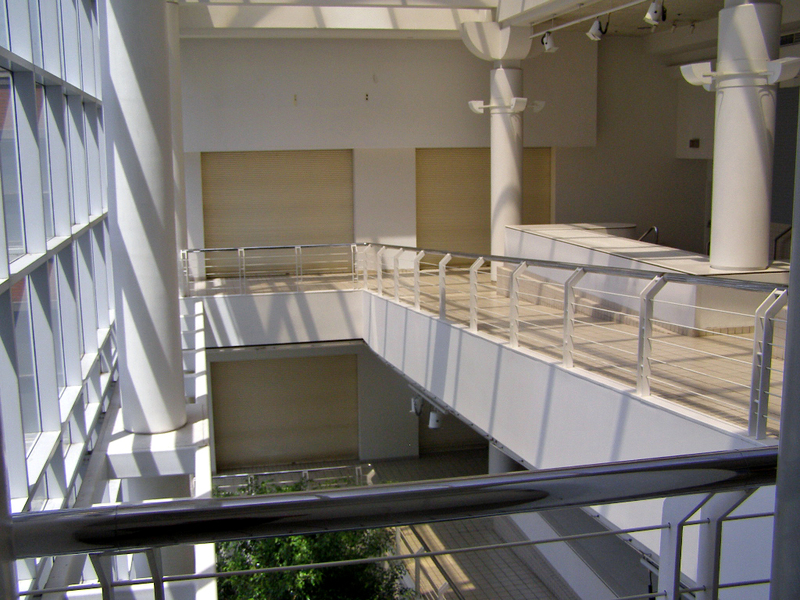 The connections to the department store shuttered permanently in 2001 after Dillard's who had bought out Stix Baer & Fuller in 1983 closed the Downtown store which had already been downgraded to a "clearance center" in the mid-1990's. By 2003 according to an entry in deadmalls.com, Dillards would have no Downtown locations anywhere. A rendering by Trivers showing what the former Stix Baer & Fuller building will look like with the bridge removed and exterior restored. 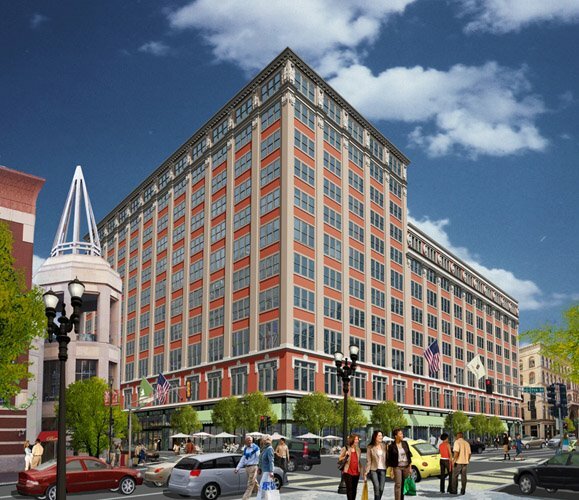 The Stix building, which will be re-named the Laurel, is also starting an $80 million renovation to include a 200+ room Embassy Suites Hotel, 200+ apartments and ground floor retail. Opening Washington Avenue will have an amazing impact in terms of re-connecting the area east of the former bridge with the rest of Downtown St. Louis. For the first time in 25 years one will be able to stand at Fourth Street and look west down the street canyon Washington Avenue as far as the eye can see. 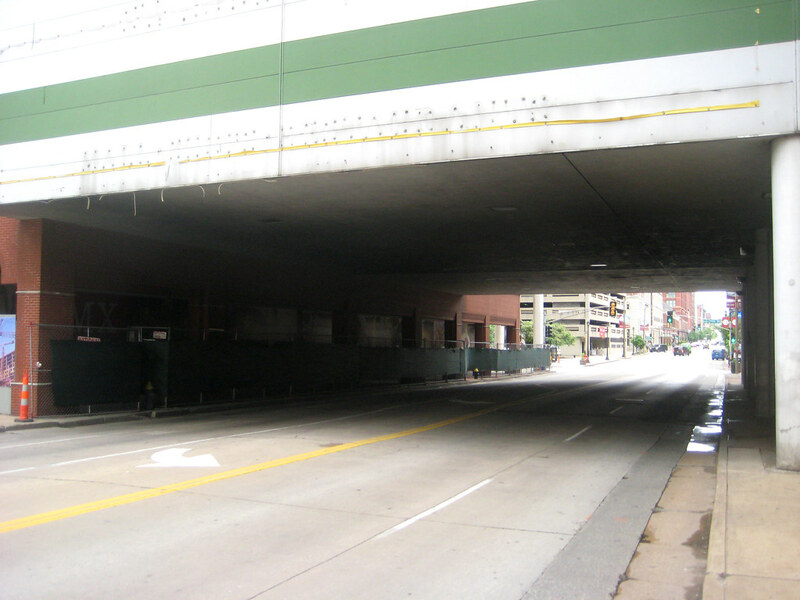 With this the only barrier left on Washington Avenue will be the elevated lanes of Interstate 70, which will be re-routed over the new Mississippi River bridge in 2014. 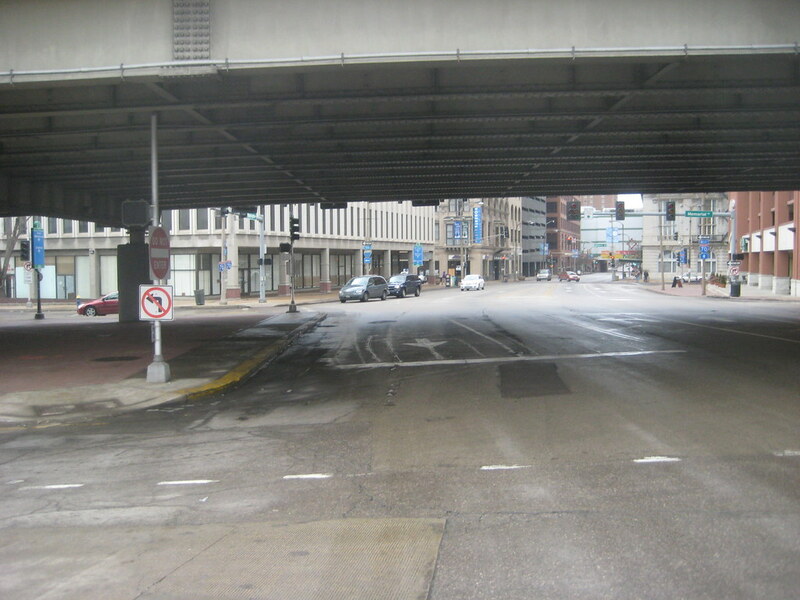 Removal of the elevated lanes would be another cause for celebration and complete the restoration of one of St. Louis' great streets. 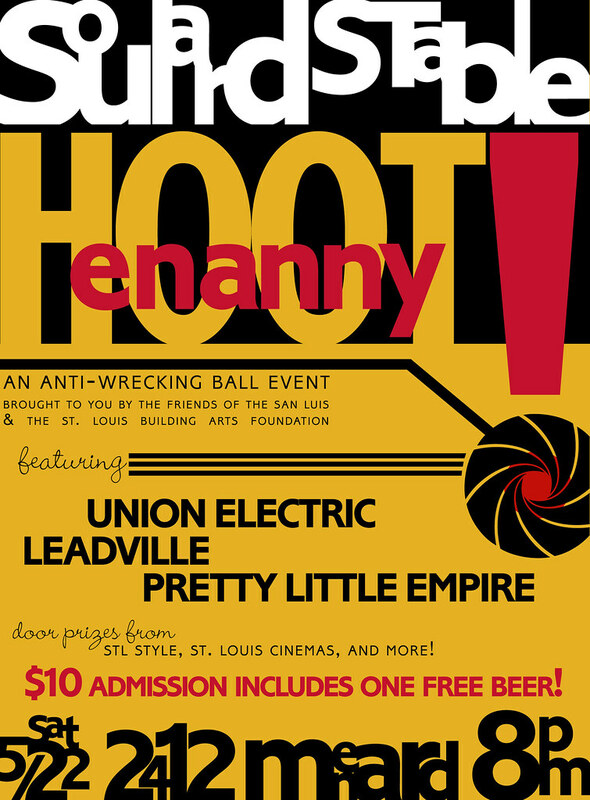 Please join us Saturday May 22nd in historic Soulard to support two great causes and enjoy three great bands for only Ten bucks!